Imperial College London and White City Place have launched a White Paper on the future of innovation ecosystems which says that tech and creative people want to work in clusters and that White City will be at the heart of a new creative and tech quarter in West London. The ‘Death of Distance’ has not materialised. “As recently as a decade ago, the “Death of Distance” was a widely coined phrase. The future of innovation was portrayed as a world where ideas would spark, and innovations arise from a globally interconnected world where people could contribute to innovation from wherever they are. An ultrafast internet connection would suffice for tapping into global communities of scientific, creative and engineering talent. Global connectedness has been valuable for innovation, but the Death of Distance has not materialised. The White Paper also found that creativity and innovation typically originate not from within single disciplines or domain areas, but from the spaces between them and that location is as important as ever for business competitiveness. The White Paper offers an outlook on how White City is becoming London’s new innovation district, containing all the key building blocks of a thriving innovation ecosystem in the making. As a former industrial district, and most notably home of the BBC, Imperial’s White City campus has the foundations of a world-class innovation hub with the potential of informing, influencing and inspiring the next wave of technological innovations. 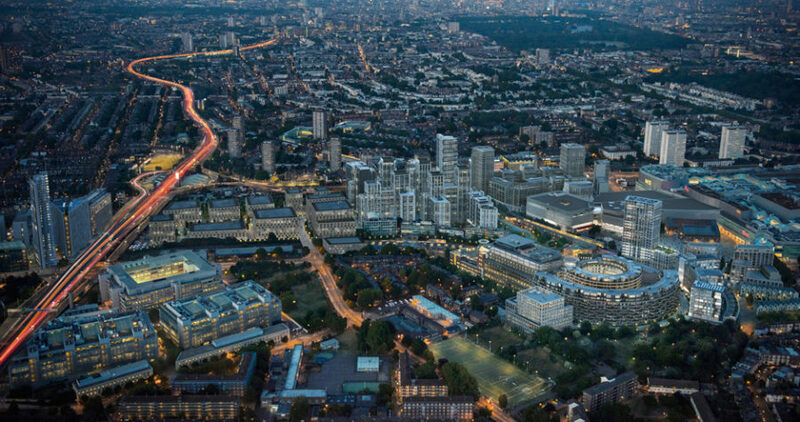 In collaboration with entrepreneurs, existing businesses and large corporations that cut across traditional sector boundaries – and through clever property development and spatial design – White City offers great opportunities for a world-class ecosystem to flourish. The emerging new White City campus of Imperial College, in conjunction with the renewed energy of entrepreneurs and corporations to locate at the nearby White City Place, creates opportunities for a world-class ecosystem to develop. The White Paper was commissioned by the developer Stanhope, and its investment partners Mitsui Fudosan and AIMCo, and its thinking has contributed to and supports plans for the refurbishment and redevelopment of White City Place. The paper was written by Dr Anne ter Wal, Dr Christopher Corbishley and Professor David Gann, all of Imperial College Business School.